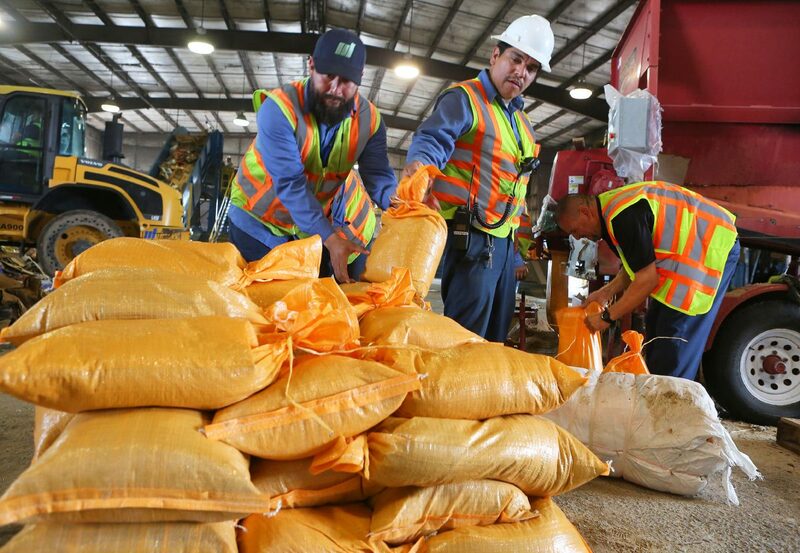 Sandbags are created and dispensed by workers at the McAllen Recycling Center on Monday, Sept. 10, 2018, in McAllen. 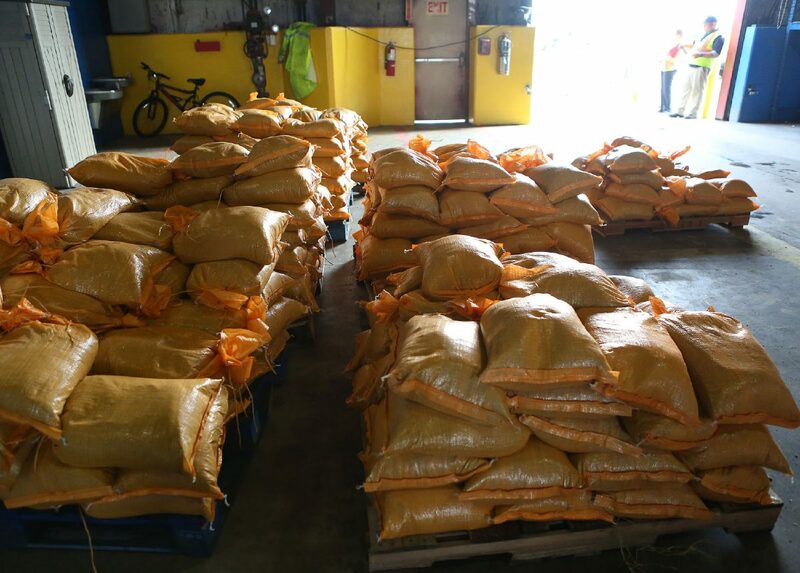 McALLEN — The city distributed 1,100 sandbags to residents on Monday after rain started pouring on the city Sunday, nearly three months after 2,700 homes were damaged during June storms. 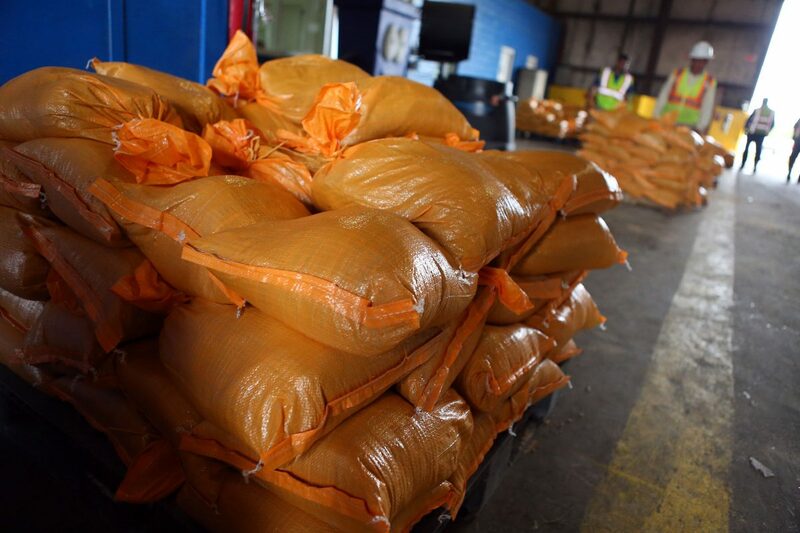 Rain is expected throughout the week, and sandbags will be available again Tuesday beginning at 7:30 a.m. at the city’s recycling center at 4201 North Bentsen Road. Residents need to show identification and a utility bill. “We’re thankful for the rain, we’re also thankful when it doesn’t come so fast,” said Assistant City Manager Jeffrey Johnston. Residents are still dealing with the aftermath of the June storms. Federal Emergency Management Agency officials are still in town to help. 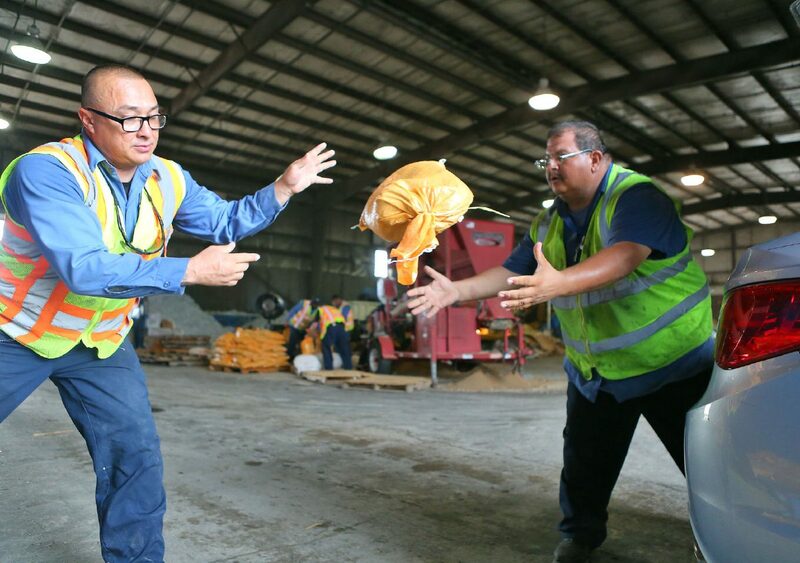 Rene Leal tosses a sandbag to Ruben Lopez as he places them in the truck of a car as sandbags are created and dispensed by workers at the McAllen Recycling Center on Monday, Sept. 10, 2018, in McAllen. City officials are fortunate that McAllen voters approved a $22 million bond in a May election for drainage improvement projects in the city. There will end up being 22 drainage projects stemming from that bond election, according to the city budget. The city’s 22 drainage projects from the May bond election will likely cost $11.6 million over the next year and $9.9 million the following year, pending commission approval. The drainage utility fee collection, meanwhile, varies depending on the size of a property. McAllen’s engineering department estimated the average residence in McAllen is 2,700 square feet, which would amount to a $1.50 monthly fee on residents’ utility bill. The average McAllen property’s drainage utility fee would be $18 per year. City officials determined the fee for each property by taking the total square footage of impervious cover at a property, divide it by 2,700 — the average square footage of a McAllen single-family residence — and multiply that number by $1.50. Impervious cover is everything on a property that is essentially an artificial structure. Examples of impervious cover include a garage, pool house, cabana or porch. The Hidalgo County Appraisal District uses codes for every piece of impervious cover on a property. These codes appear on property tax bills. The city uses these codes to determine square footage of impervious cover on the property. The city hosted public hearings for the drainage fee, but the public was not interested. Less than 50 people attended the multiple hearings in the winter.